To till or not to till . . . That’s the question! From large-scale farming to home gardens, reduced tilling or no-tilling cultivation is becoming part of discussion about maintaining healthy and productive soil. The argument is that over-tilling can upset the complex balance of microorganisms and structures that are key to naturally healthy soil, and it's a valid perspective. - When time isn’t on your side – Over-layering organic materials on top of the soil is central to no-till gardens. In fact, it’s common for minimum winter overlayers of at least eight inches. Some gardeners turn the overlayer with a spade in the spring, and others add to the layer through the growing season, and let it transition into soil. In either case, time is the operative word. Spreading eight inches of compost on tough soil gives you a nice top layer but it doesn't instantaneously make the soil below healthy. Sure, you may want to transition to no-till after an inaugural season. But for a garden this summer, consider bringing in mulch and compost, and till it into your garden soil at a shallow till setting. Then build on that base. - When the soil is tightly compacted -- A Cornell horticulturist was speaking about trees and shrubs, but her point covers a lot of ground: "Soil compaction is the single most difficult and harmful environmental or abiotic condition that a tree or shrub can experience." And that's not too far off for vegetables, as well. A super-good top layer doesn't immediately trump a base of tightly compacted, low nutrient soil. 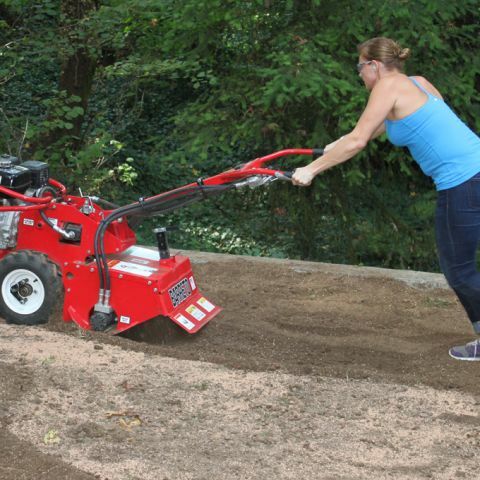 A tIller is very valuable when you need to add amendments such as sand, Turface, gypsum, perlite, wood chips, etc. to compacted soil, creating air pockets, adding nutrients, and improving drainage -- all to enhance the biome within the soil. - When the weeds got the best of you – Overlayers can prevent weed growth, and hand-tools like weed weevils are great. Heck, the human hand is remarkably effective. The toe of your boot -- not so good, but that won't prevent some of us from giving it a try. 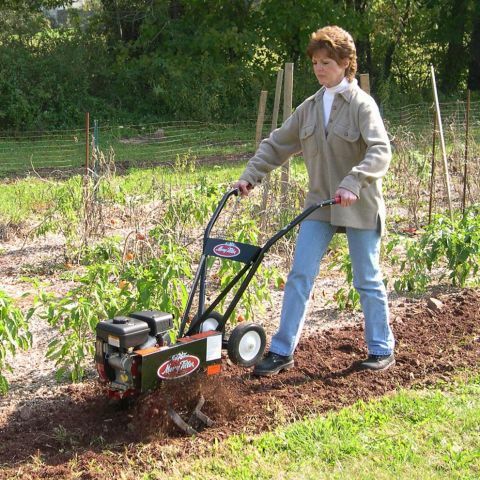 Bring in a tiny garden tiller, be sensible about how deeply you till. - When you're new to the game – Experienced gardeners hoard and transform lawn clippings, leaves, pine needles, soil, vegetable scraps and wood chips (Have you seen the movie Fargo?) Whether you build a compost bin, a pile or whatever . . . start your mulch effort as you being this year's garden campaign -- it will come in handy next year, whether or not you till!